Camso, Magog, Quebec, says it is growing its material handling distribution and tire service footprint in southern Texas through the acquisition of Omni Industrial Tire, which has four locations in that state. Camso bills Omni Industrial as the second-largest tire specialist in Texas, with four locations and “a well-established reputation.” Omni offers a variety of solid and pneumatic tires for forklifts and skid-steer loaders. 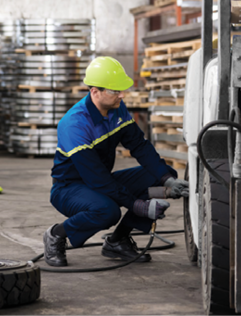 The material handling equipment market in Texas represents a great opportunity for Camso for tire distribution and for Solideal-On-Site Service, the company says. “Omni joins our service organization and will help us continue to deliver the highest level of commitment in industrial tire service,” says Bulger. Camso engages in the design, manufacturing and distribution of OTR tires, wheels, rubber tracks and undercarriage systems to serve the material handling, construction, agricultural and power sports industries. The company employs more than 7,500 people and operates research centers and manufacturing plants in North and South America, Europe and Asia. Autocar Trucks, Hagerstown, Indiana, plans to celebrate its 120th anniversary with a party for Autocar fans at its Hagerstown factory Oct. 21. The celebration features live music, food and an Autocar vintage truck show. Autocar, founded in 1897, manufactures cab-over trucks, including Class 8 refuse and recycling trucks, concrete pump trucks, terminal tractors and trucks for other severe-duty applications. The company also plans to welcome vintage Autocar truck owners to the event for a truck show. In addition to the truck show, tours of the Autocar factory are planned. Autocar says it is considered the oldest motor vehicle make in the U.S. and built America’s first truck in 1899. Rehrig Pacific Co., Los Angeles, debuted its new bear-resistant roll-out cart at WasteExpo 2017 in May. The cart, designed to withstand the efforts of what the company describes as “even the most determined bears,” is manufactured to help communities that struggle with the animals getting into residents’ waste. The carts work with semi- and fully automated trucks. Foster says the most important feature of the carts is their easy-to-use, ergonomic design that doesn’t require waste haulers to alter their processes. “We like to say that this cart is bear-resistant but not human-resistant,” he says. The cart unlatches automatically when inverted by semi- or fully automated trucks, allowing for easy integration into any waste collection system, according to the company. Rehrig Pacific’s all-plastic makeup is designed for durability and longevity. Cart lids, locks, catch bars and bodies are all preassembled upon delivery, and assembly time for cart wheels and axles averages less than 10 seconds per container. BioHiTech Global Inc., Chestnut Ridge, New York, has announced the launch of BHTG Smart Mode, a new technology for its EcoSafe and Revolution series digester lines of on-site food waste disposal equipment. Smart Mode is designed to use cloud computing, machine learning and the on-board internet-connected computer in the digester to drive the equipment. The company says it has filed a provisional patent application for the new software and believes this technology can be used for intelligent control of many types of programmable industrial machines serving a wide variety of vertical markets beyond waste disposal. The software will be installed in all future deliveries of its internet-connected digesters, and the company expects to equip all currently supported internet-enabled units by the end of the year. Bigbelly Inc., a Needham, Massachusetts-based manufacturer of waste and recycling systems, has filed complaints with the U.S. Central District Court in California and the German court alleging that Ecube Labs Co. Ltd., South Korea, Ecube Labs Co., Los Angeles, and EconX Waste Solutions B.V., Netherlands, infringed on two Bigbelly patents covering energy management technologies for solar-powered compactors. These patented Bigbelly technologies enable the Bigbelly smart waste and recycling system to manage an energy budget based on the solar energy harvested and the energy needs of the station, the company says. It requests that the U.S. and German courts issue rulings confirming that certain Ecube and EconX products infringe Bigbelly’s U.S. and European patents. The Hino Motors Manufacturing facility in Williamstown, West Virginia, recently celebrated 10 years of medium-duty truck production. The plant makes Hino’s Class 6 and 7 conventional-body-style trucks. The 245,000-square-foot plant is a part of Hino Motors Manufacturing USA Inc., Farmington Hills, Michigan, a wholly owned subsidiary of Hino Motors Ltd. and a sister company to Hino Motor Sales Inc., Novi, Michigan. He adds, “Without their commitment to quality, Hino Trucks would not be the premium brand name it is today. “I would also like to thank the state of West Virginia, Wood County and the city of Williamstown for their tremendous partnership over the past 10 years,” Noguchi says. Yearly production has increased by more than 500 percent since 2007, and the production facility has been expanded and capacities enhanced. The ceremony also included statements from state and local government officials. New Way Trucks, Scranton, Iowa, has announced the addition of a new refuse truck dealer in Utah. Based in Salt Lake City, Semi Service Inc. brings more than 40 years of sales and service experience to the New Way dealer network. Semi Service Inc., which has two locations in Salt Lake City, will sell New Way products throughout Utah and also will service all New Way trucks. The family-owned company was established in 1972. With a new repair facility with 46 bays and 25,000 square feet of parts in stock, Semi Service says its a leading provider of truck service and repair. The move helps further solidify New Way’s presence in the western U.S. and bolsters its growing dealer network, according to the company. New Way recently announced the addition of dealers in Wisconsin, Louisiana, New York and Ohio, as well as hiring waste and refuse industry member Don Ross. Waste Connections, The Woodlands, Texas, has installed a nonwrapping Lubo Systems 440 screen supplied by Van Dyk Recycling Solutions (VDRS), Stamford, Connecticut, at its McKinney, Texas, material recovery facility (MRF). The screen is 6 feet, 7 inches wide and replaced a traditional screen installed in 2008. The new screen sits atop a 6-foot-7-inch-wide commingled screen as the top deck of a two-deck setup. According to VDRS, the nonwrapping 440 screen can be retrofitted into any system. With the previous screen, despite having three employees dedicated to cleaning the top deck during every break and lunch and three employees cleaning the screen for 1.5 hours between shifts, the screen would be blocked with plastic bags within 30 minutes of any shift, and the bottom deck often went neglected, according to VDRS. The MRF often would operate with three fewer quality control (QC) sorters so those employees could take breaks. With the new 440-style screen, which VDRS installed in early August, the McKinney MRF now can allow all sorters to break at the same time. QC is never shorthanded by three sorters, and the cleaning time needed for the screen has been reduced to 15 minutes, which is performed by one laborer at the end of each shift, says VDRS. The Waste Connections facility has had less fiber in the containers and fewer containers in the fiber, according to VDRS. With the screen’s addition, Waste Connections says some of the recent shifts at its McKinney MRF have been the MRF’s highest production shifts ever recorded.